Dr. Meserkhani can skillfully provide you with a high quality, full-mouth dental restoration in a single day. 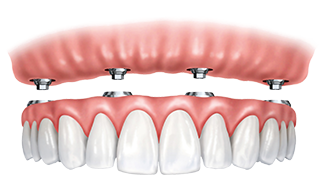 Using a revolutionary procedure that he was instrumental in developing, he places just four dental implants per arch to support a complete new set of upper and lower teeth. The most seemingly hopeless smile can be replaced with a stable and healthy one in just one day with Fix-on-Four™. 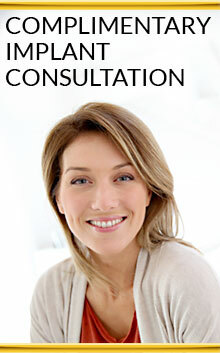 The procedure provides an effective, efficient and long-lasting solution for missing teeth. and angles. The procedure rarely requires bone grafts, and even patients who have severe bone loss as a result of years of missing teeth can benefit from the Fix-on-Four procedure. Dr. Meserkhani is a renowned expert in the fields of dental implantation and tooth restoration. He has been awarded a Diplomate from the American Board of Oral Implantology, the most difficult and prestigious certification in oral implantology. This certification has been awarded to only 400 dentists in the United States since 1969. Dr. Meserkhani also lectures both nationally and internationally on oral implantology, prosthodontics and collaborative dentistry. Using high-tech imagery, Dr. Meserkhani can locate the best area of jawbone to place dental implants. Dr. Meserkhani’s approach to ensuring your implant-supported dentures last a lifetime is to locate a healthy foundation of bone and tissue to secure the implant posts. Highly detailed images captured by our CT cone beamer scanner show Dr. Meserkhani the quantity and quality of your existing bone, the position of your sinuses and additional information about your teeth and gums. He uses this comprehensive information, in conjunction with computer imaging and three-dimensional study models, to precisely plan the location, angle, dimension and length of your dental implants. Advanced planning, surgical guides and years of experience make the dental implant minimally invasive, with little post-operative discomfort. Over the years, Dr. Meserkhani has placed thousands of implants with a very impressive success rate of 98%. Dr. Meserkhani takes meticulous measurements to create your final teeth, determining the precise shape and length that will best complement your features. He works closely with our in-house lab to select a natural-looking shade for your restoration. You will never be without teeth! While your final teeth are being fabricated, Dr. Meserkhani will fit you with natural-looking, high-grade and functional temporary teeth. Your final teeth are made with lifelike, durable acrylic and porcelain, and are designed by Dr. Meserkhani to be esthetic and comfortable, while also providing a strong bite. They look, feel and function like natural teeth! Joe had a full-mouth reconstruction, with crowns, bridges and implants on top and the Fll-on-Four procedure on the lower arch.